Hello there! Which of these three lovely e-books would you like to win? All three of these are childhood favorites of mine. 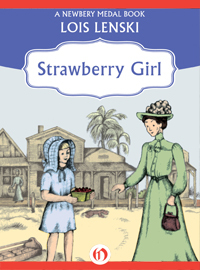 I remember reading Strawberry Girl with my mother in early elementary school, and loving it! The funny thing is, I don't remember anything about the book. I just remember that I loved it. I'd enter to win this one just so I could refresh my memory (and so I could read it aloud to my kids when they got to elementary school)! Apparently, it is the story of Birdie and her family on the Florida frontier. They are trying to start a strawberry farm despite droughts, cold snaps and dastardly neighbors. It won the Newbery medal. I read this one a couple of years ago, as an adult. I couldn't remember if I'd read it as a child or not, so I decided to give it a try. It was utterly charming. It's the sweet story of unassuming Mr. Popper and how he accidentally ends up with a set of performing penguins that make life grand. 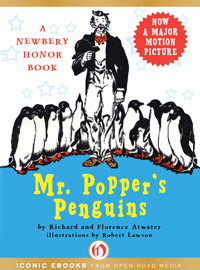 Not long after I read Mr. Popper's Penguins, I heard a movie version was coming out starring Jim Carey. After seeing the trailer, I decided I'd pass on seeing it. So, if you saw the movie (or it's trailer) and were underwhelmed, you might try the book. 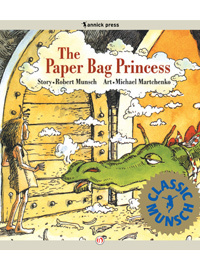 The Paper Bag Princess is one of my very favorite picture books. I loved it as a kid and I love it now. It was one of the first picture books I bought when I moved away from home. It is the story of Elizabeth, a lovely princess who cleverly rescues her handsome prince, Ronald. The story ends with an intriguing twist, and is beautifully illustrated. This happy little giveaway will have three winners. It is sponsored by Open Road Media, as part of their summer reading campaign, "Avoid the Summer Slide!" Check out their video -- it made me smile.